Why the change? To honor the rapid growth and maturation in the cleantech sector. Companies in the wind and solar power, battery storage and energy efficiency sectors have grown beyond their “green” origins, into dynamic clean economy industries. They might have started as green, but they now have significant acquisition prices, employ hundreds of thousands of people and are the cutting edge of the American economy. These technologies are now winning on price, with only limited (and highly popular) policy support, while incumbent energy sources benefit from lucrative government subsidies despite having matured decades ago. Looking for evidence that the conversation has moved from green to clean? 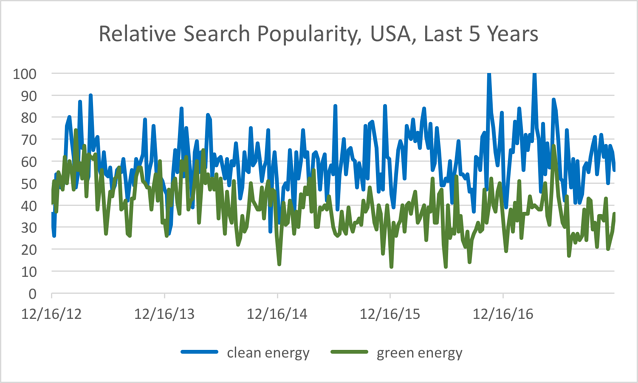 The below graph shows the relative popularity of searches for “clean energy” and “green energy” in the United States over the past five years. Until the end of 2014, the two terms were used about equally often. But since then, the “clean” phrasing has been more frequently used. This is where the conversation is heading. And we’ve now rebranded our blog to reflect this. We at Tigercomm see this blog rebranding as a chance to celebrate the clean technology industry for all its advancement over the years. Because in our work, word choice matters – even when it’s a change of just three letters.